London, 24 January: The Global Warming Policy Foundation (GWPF) has lodged a new complaint to the BBC about its misleading reporting on global warming. The BBC’s News at Ten programme on the 18th of January 2018 contained two factual errors in its report of the global temperature of 2017. The errors were in the cue to the report by Roger Harrabin, and in the report itself. The newsreader, Huw Edwards, said that 2017 was “the hottest year on record,” insinuating that global temperatures have continued to rise last year. This is untrue. In reality, global temperatures have declined in the last 12 months. According to the Met Office, 2017 was the third warmest year on record. 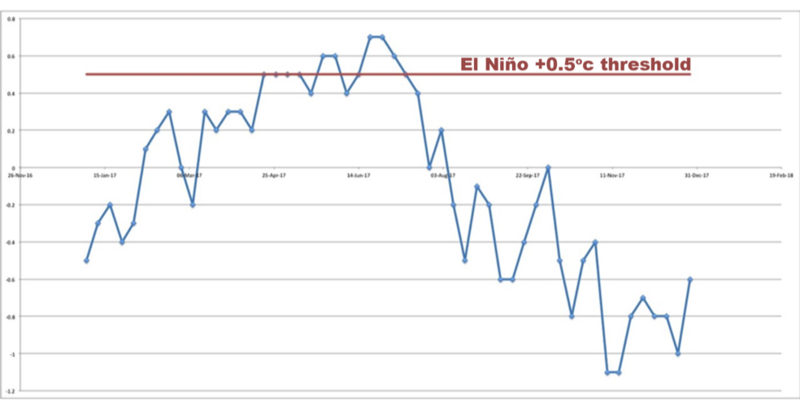 El Niño warming was evident during eleven weeks in the spring and summer of 2017, pushing global temperatures up accordingly. According to the National Oceanic and Atmospheric Administration (NOAA) there were El Niño “conditions” for nearly three months in 2017, but they did not lead to an El Niño “event.” A formal El Niño event was not declared because the El Niño heating did not continue for five consecutive three-month periods. “These are two factual errors that should be acknowledged with an on-air apology and a correction on the BBC’s Corrections and Clarifications page,” GWPF director Dr Benny Peiser said.